Imagine: Your thermostat has learned your habits — you leave at 8 a.m. and return home around 6 p.m. — and you like your house to be warm when you get back. You mostly stay in on weekends. Your fridge helps you with your Sunday grocery list and your smoke detector texts you when it needs a new battery. Smart homes are almost like living with a fleet of robots. This seems like sci-fi but smart devices are the talk of neighbourhoods everywhere. Back to reality: You might be in the market to replace your worn-out appliances or to retrofit your current, not-so-smart ones with some smart capabilities. You want to consider your options and find the best way to give your home a more comfortable, modern edge. Read on. Smart refrigerators help to make shopping and cooking easier with built-in apps that let you store shopping lists and recipes, and check the temperature of the fridge. Some models can self-adjust during times of peak energy usage. Others can tell you what ingredients you’re low on or are about to expire. They can also send notifications to your mobile phone to report on energy and let you know if anyone has left the fridge or freezer door open. Smart ovens enable you to manage your cooking anywhere — whether from your couch or your desk at work — using your mobile phone. Despite the fact we often overlook their importance, we depend heavily on smoke detectors. Smart smoke alarms, like Nest Protect, can not only alert you to smoke, they can also tell you where the smoke is. It provides this warning early, before the smoke becomes a raging fire. New models of smart smoke alarms are often self-testing, long-lasting and don’t go off if you’ve fogged up the bathroom with steam. And like most smart devices, they’re controlled via your smartphone. Birdi, another smart smoke alarm, also measures air quality and carbon monoxide levels. Smart ovens enable you to manage your cooking anywhere — whether from your couch or from your desk at work — all with your mobile phone. Set the temperature from elsewhere, cook and check on the progress, even watch a video of your food cooking. When your food is cooked, June, just one of the smart ovens currently available, will send you a notification and automatically turn off. Smart thermostats, also called learning thermostats, keep track of your habits. They keep a record of the energy your home uses over a period of time, and then help you modify your usage, saving you money in the long term. Most can be linked to your mobile phone, enabling you to adjust the settings manually from anywhere. The Ecobee3 has all these features and also uses remote sensors, placed throughout your house, to improve motion control. The thermostat keeps track of when people are home or away, and can sense the temperature in more rooms than just the one the device is in. Washing-machine technology has made great strides in the last 100 years. Even new, not-so-smart washers are still well-equipped. Rapid drum movements, cold-water efficiency and water jets clean more clothes in less time than ever before. Smart washing machines just tack on a few features to this technology. The LG SmartThinQ allows you to monitor your laundry remotely. Start it during off-peak periods, to reduce your energy bill. Check data to see how you can improve efficiency and troubleshoot any issues with Smart Diagnosis. If you don’t want to buy new appliances, you can retrofit existing ones instead, in line with your budget and preferences. If you’re not keen on purchasing new appliances, you can fit smart devices to existing ones instead. How you decide to retrofit your home will depend on your budget and preferences. 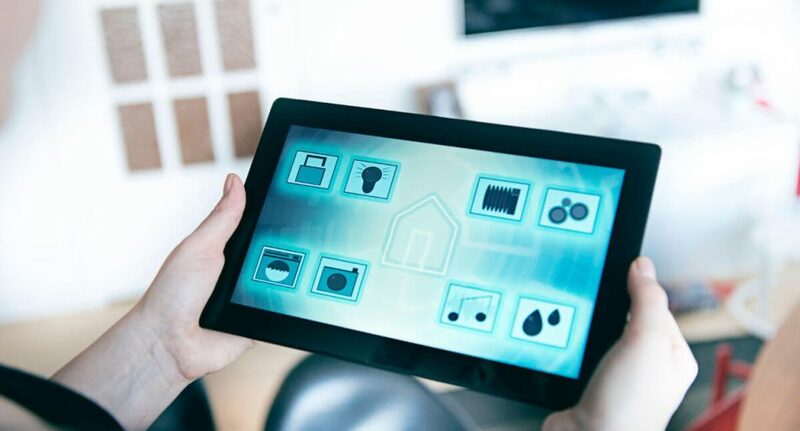 Complete smart homes, which are homes fitted with technology that controls all of the electrical functions and features via one system, can be costly, and older-style homes may face limitations when it comes to installation and cabling. Some companies specialise in smart kits, which are add-ons and modules that can make your existing appliances smart. These kits are a cost-effective solution as they don’t involve purchasing brand-new appliances. These include: SmartThings (a Samsung company), littleBits and Apple’s HomeKit. If you’re not sold on purchasing a whole kit, consider upgrades to selected devices. Take the Roost, for example, a Wi-Fi-enabled nine-volt battery, complete with app. The battery transforms regular smoke alarms into modern, connected devices. It’ll alert you via smartphone if the alarm goes off and let you know when it needs to be replaced. Smart technology can help you make your home more environmentally friendly. By controlling your energy and water usage, you’ll be able to reduce your consumption levels and only use what you need. Smart devices can be added to your hot water and heating systems, allowing you to manage them with a simple dial. They’re convenient, with most smart devices able to be monitored and controlled remotely. And the whole setup is pretty impressive technology, don’t you think? Speak to an expert: Speak to a supplier who specialises in smart appliances, or find a company that specialises in smart technology and request an initial consultation. This will help you better understand your needs and determine whether to purchase new devices or sync current ones. Work out your budget: Smart technology can be expensive, so if you’re trying to keep costs low, a few core smart devices to get started could be a better option than a complete fitout. Prioritise: Do you want to save money on your electricity bill? Do you use your oven every day? Work out which devices and electrical items you use most in your home and what would make your life easier, as opposed to what sounds impressive.